Sony computers has recently launched a new model, Sony Vaio SR 36GN in their SR series. Sony Vaio SR 36GN comes with an unmatched black finished body which symbolizes an expression of strength. 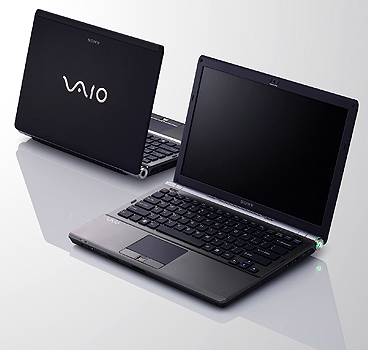 Sony Vaio SR 36GN comes with advanced specifications which are ideally suited for the mobile computing. This unique cylindrical shaped notebook has an isolated keyboard for inputting data easily and making it more flexible for the users. Sony Vaio SR 36GN uses the latest technology Intel centrino 2 for its processing, this not only boost the speed of operating but also enhances the overall processing. It comes with a convenient switch function key which is placed at the lower frontal end of the screen. The switch key provides the users with easy navigation between various functions. Sony Vaio SR 36GN comes with an excellent processor bus system of 1066 Mhz and memory bus of 800 MHz which boosts the speed of computer. It has a SDRAM of 3 GB which is divided into 2 slots 1GB and 2GB; these multi slot systems are useful in enhancing the speed of the applications. 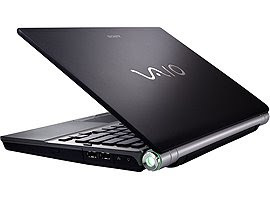 Sony Vaio SR 36GN has in built memory stick slot which allows the users to share their data directly from the memory card of their mobile or camera. Sony Vaio SR 36GN is fully equipped with other features like frontal 1.3MP camera for easy video conferencing, Wi-Fi internet connection, Digital 3D support sound to tune in to your favorite music with live effects, amazing 13″ TFT bright display, Bluetooth connectivity for easy sharing of your data and files and the most prime features of all is its long battery life of up to 4.5 hours. All these features are bundled just into 2.7 kgs! Sony laptops are definitely making a big impression on the global markets.